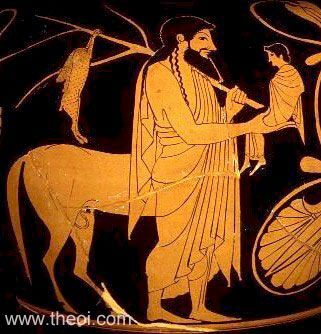 Side: The centaur Chiron holds the boy Achilles in one hand and in the other a branch hung with a hare. The centaur is clothed in a chiton and is depicted with the full body of a man--including legs and feet--with the torso and rear legs of a horse attached to his rump. Neck: Nereid Nymphs holding fish (see other image).